The most comfortable beds we have slept in during our many trips throughout Europe. Host was very accessible, kind, helpful. Kitchen was very well equipped and bathrooms clean with plenty of hot water for a large family of 6. Fantastic location- so many restaurants, cafes and extensive metro connections within a few blocks. The apartment was perfect for two adults and 2 teenagers. Very good location close to Louvre, Seine, Latin Quarters etc. We could check in two hours earlier and they allowed to us to leave our luggage in the apartment on the checking-out day because our flight was late in the afternoon. The hosts were exceptional. The locations was absolutely amazing - walkability to all the major museums or easy metro access. Space was great for a family. I would absolutely recommend to anyone that asks. The apartment was much larger than expected, the beds were very comfy (including the pullout couch which is unusual!). The location was great, nearby lots of things and easy to walk most places. We had a wonderful trip! 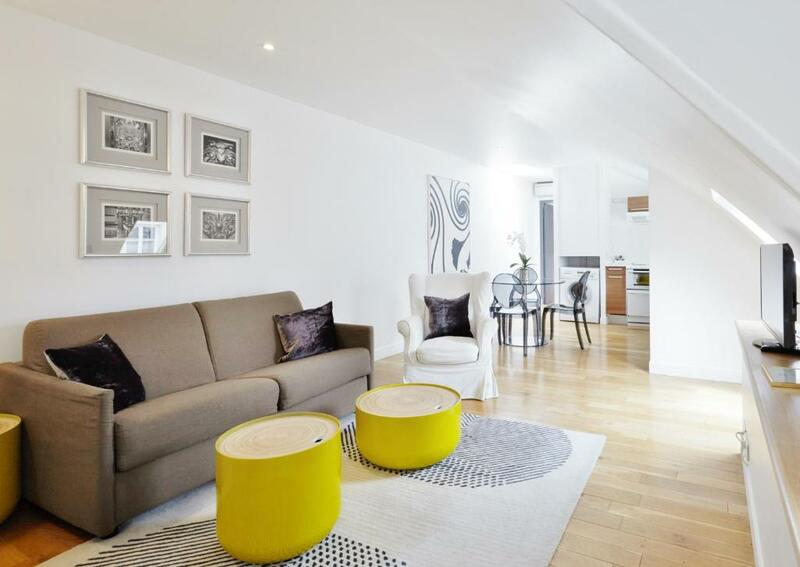 Spacious and bright apartment on the top floor. The location is perfect. I could walk to everywhere including shopping areas, restaurants, and a nice jog a long the river to the Eiffel Tower (about 3 miles). The apartment was located in a great spot in Paris, walking distance to the Seine, Notre Dame and the Louvre. Also right near a Metro stop. It has everything we needed. Stayed in a room without city view, which I think was perfect, because it was very quiet. This is the 5th time I've visited Paris and this was the best location, with easy access to everything a tourist would think of. Getting from and to the airport (CDG) is very convenient with RER B to/from Chatellet. The size of the studio was adequate, much better that other places in Paris that I stayed in. I've made a habit of visiting Paris once a year and I will definitely try to get this place again next time. Chapeau! Great location, easy check-in, and flawless communication. HUGE apartment for Paris standards. 3 couples can sleep comfortably. Will stay again for sure. Just a short walk from Pompideu. Location was fabulous!! Beds were both king and pull out sofa was a queen, very easy to use and one of the most comfortable sofa beds I've ever slept on! We had everything we needed for a fantastic vacation with 5 adults. Our apartment faced the courtyard which we all loved. The host was extremely helpful. Lock in a great price for Apartments Du Louvre - Le Marais – rated 8.9 by recent guests! 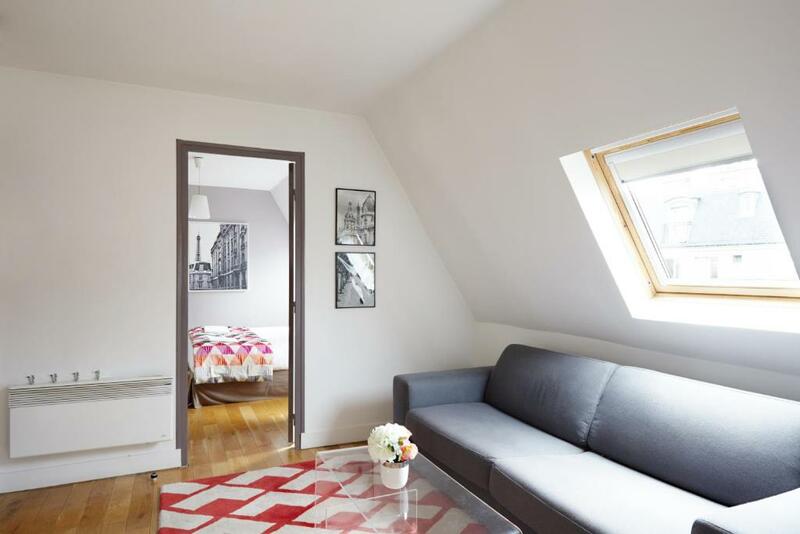 One of our top picks in Paris.Apartments Du Louver - Le Marais offers self-catering accommodations located in Paris, within walking distance from the George Pompidou Center and Les Halles Shopping Mall. The apartments feature high ceilings and parquet flooring. Free WiFi access is available. Apartments Du Louver - Le Marais is 2,950 feet from Louver Museum. If you feel like visiting the surroundings, check out Noter Dame Cathedral and Place de la République, both located 0.7 mi away. This is our guests' favorite part of Paris, according to independent reviews. In this area you can shop 'til you drop for popular brands like H&M, Zara. 뀐 Located in the real heart of Paris, this property has an excellent location score of 9.6! 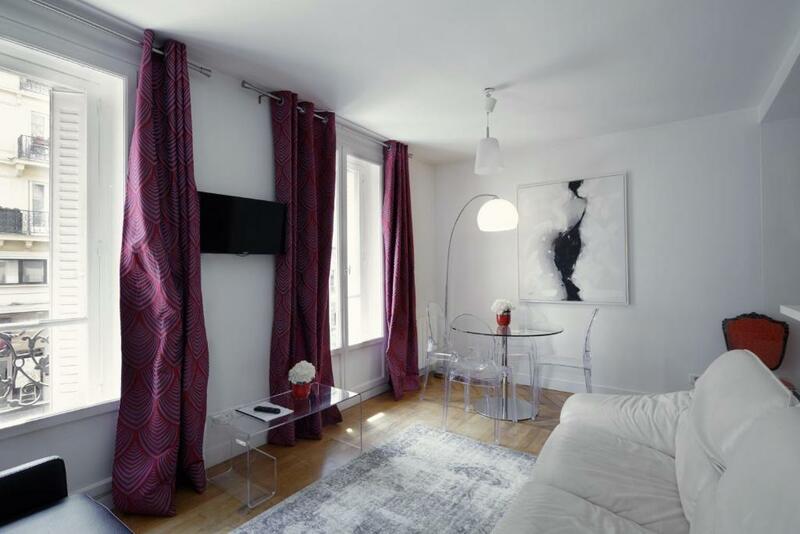 When would you like to stay at Apartments Du Louvre - Le Marais? This apartment with street view features 2 bedrooms, separate toilet and a bathroom with shower. The kitchen is fully equipped with a washing machine. This apartment does not have air conditioning but fans are provided. This modern apartment has 2 bedrooms, fans and a sofa bed in the living room. It offers a view of the courtyard and can accommodate up to 6 guests. This apartment has 2 bathrooms and a fully equipped kitchen. The apartment does not have air conditioning but fans are provided. This apartment features an oven, dishwasher and an electric kettle. Air conditioning is not featured but fans are provided. Located on the courtyard side this studio has fans and a kitchenette equipped with an electric kettle and a washing machine. It offers free WiFi. This apartment features air conditioning, stovetop and soundproofing. It also provides a roof top with view. The building has elevator access until the 5th floor. Guests have then one floor walk up to access the apartment. The advantage of this Hausmanniann building is it's size: large rooms and high ceilings make our apartments very easy to live in. Though we have been renovating the apartments, we have kept the classical aspects of this building that make it so charming. We manage the rentals in the whole building, which makes it a lot easier for us to make sure there are only good surprises! Margaux, Charlie and Nicole welcome you to Apartments du Marais. We are brother and sisters in charge of managing the whole building in order to make sure our guests have a great experience. We have been growing our companies (Apartments du Marais and Apartments du Louvre) since 2012 and love our jobs! Having grown up in France, Italy, the United States, Spain (Nicole), we speak many languages, and love interacting with people from all over the world. Our central location make it a lot easier for our guests to walk to Paris' major attractions. We are short walks from many museums (Pompidou center, Louvre, Opera, Orsay etc...). Our immediate neighborhood. a block away from the historical Montorgeuil neighborhood where you will find many restaurants and cafes, as well as delicious bakeries cheese shops etc... We are also at the border with the Marais neighborhood, which is great for sight seeing, shopping and eating. Area Info – This neighborhood is a great choice for travelers interested in architecture, shopping and art – Check location Excellent location – show map Guests loved walking around the neighborhood! House Rules Apartments Du Louvre - Le Marais takes special requests – add in the next step! Apartments Du Louvre - Le Marais accepts these cards and reserves the right to temporarily hold an amount prior to arrival. Bookers must be at least 18 on the check-in day. Please inform Apartments Du Louvre - Le Marais of your expected arrival time in advance. You can use the Special Requests box when booking, or contact the property directly using the contact details in your confirmation. Construction was extremely loud and dust in the air was hard on our eyes and throat. No views of Paris from apartment, just courtyard under construction. The neighborhood is convenient but not charming. Snall living area and kitchen, but amazing size given the central location. Amazing location! So close to the Metro stop and we could walk into the Louvre. Four streets away is an incredible market street with all the food stalls, restaurants and bars you could want. Would have liked a wardrobe or at least some hanging space. Great location - we were able to walk to Notre dame, louvre and close to metro. Good communication from hosts and met us. Clean and tidy apartment with all facilities. Fantastic bakery around the corner! !- we could have lived on the pan au chocolates! The absolute only thing missing was I wished I had a broom available to use because we had issues dropping crumbs in the kitchen! It’s a stretch to find anything to complain about! There was work going on in the apartment and it smelled of paint. The apaprtmwnt was not clean when we reached. There was work going on in the building and was very noisy. They had not informed us about it. The location was really nice. In a room with 5 people the 25 minutes of hot water was challenging. Showers were extra short. The location was excellent. A short walk to the Metro and the check in process was smooth and easy. We arrived earlier than the check-in time and the host accepted us and took us to our room. Check out was just as simple with the ability to leave our bags in lockers. The room size was excellent and the extra fold out bed for our 7 year old was perfect. Everything from the decor, cleanliness, staff. Especially the location. Metro 2 mins walk away. We love Paris and we are planning to go back this year and will be booking this apartment. The restaurant downstairs was renovating & the noise woke us a few times. But they were operating within their noise restrictions & we were out for the bulk of it during the day so it has a minimal affect on our stay. The apartment was spacious, comfortable & tastefully decorated. The location & information booklet was incredibly convenient for exploring the city & Nicole was just the most friendly, professional & accommodating host you could ask for. Great location, great restaurants , close to the Louvre, Palais Royal and to the Marais. The apartment was ok, however the beds are old and lumpy, the pillows were also over used and old. We could have used more towels, a better blow dryer and better maid service. other than that it was a pretty good apartment with a good location. The pull-out bed in the living room, where I slept, was very uncomfortable and squeaky. I can barely strech a leg without making a lot of noise and waking but myself and my boyfriend up. Fair enough that it is not the most comfortable bed, given that it was a pull-out bed, but it shouldn't make that much noise moving around. All in all a good stay. The apartment is located perfectly. The check in process was easy - we could store our bags until room was ready and then keys were left for us in a safe in the reception. Very easy and great. The WiFi didn't work for 2 days but the host took care of the problem when I texted him. Also there is no light near the bathtub area so if you take a shower at night, it is kind of dark. There is only light at the sink area. Also the water was leaked out of the shower to the floor.